Based on Material Previously Produced or Published for Chocolat), based on the book The Cure, by Pulitzer Prize-winning writer Geeta Anand. SYNOPSIS: Fate and determination push idealistic father John Crowley (Fraser) into joining forces with reclusive medical researcher Dr. Robert Stonehill (Ford). Together, this unlikely pair faces impossible odds as they battle the entire medical establishment and time itself to find a cure before it’s too late. Also starring is Keri Russell as Crowley’s wife Aileen. 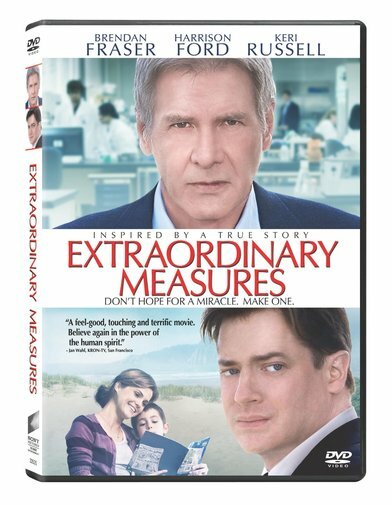 Extraordinary Measures is inspired by the true story about the power of love and faith against impossible odds. In terms of special features the DVD includes a few deleted scenes and couple of decent featurettes. The first featurette is "Extraordinary Measures: The Power to Overcome Featurette " which is a little behind the scenes of the film. The other featurette is called "Meet John Crowley Featurette" ,in which we get to meet the kid that was the inspiration of the film. Tom Vaughan managed to deliver a strong and inspirational drama that at times makes deep connections with its audience, but unfortunately is only able to be considered an above average, made for television movie. All mainly because of the performance of Harrison Ford and Brendan Fraser, who allowed the film to be a decent theatrical release back in January. The main problem with this film is that we have been exposed to similar scripts in numerous times in the past. This is the case of the film John Q starring Denzel Washington and the 1992's Lorenzo's Oil starring Susan Sarandon and Nick Nolte, films that similar to Extraordinary Measures expose the desperation and determination of what parent is able to do for the well being of his children. Overall Extraordinary Measures make for a decent rental nothing if you are in the mood of a well acted drama. This is in the case that you have seeing any of the films that I mention before, however if you are not familiar with the subject matter you will find this film totally inspirational.